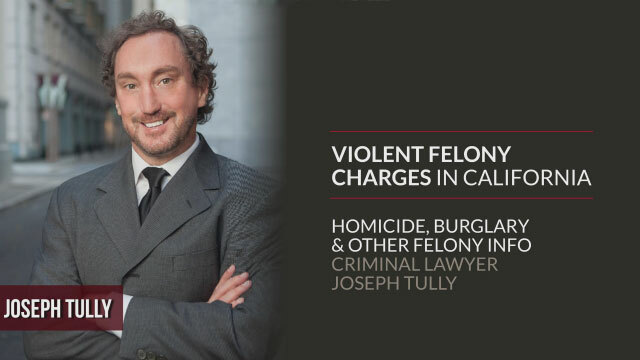 Joseph Tully, a Contra Costa and Alameda County California based criminal lawyer, looks at violent felonies under California’s Penal Code and discusses the criminal felony laws regarding violence and possible defenses. Homicide, Domestic Violence, Battery, Carjacking, and Other Crimes with Multiple Defenses. Life can be very unpredictable and sometimes good people end up in bad situations. I’m going to talk to you today about violent felonies in California. The first thing that would spring to most peoples’ minds when you bring up violent felonies would be murder or its legal term, which is homicide. Penal code section 187. Murder is characterized by the death of a human being with malice. And murder is broken up into 2 different degrees; first degree and second-degree murder both include malice. The difference between first degree and second degree is basically premeditation. Any time you think or plan ahead. So poisoning somebody, building an explosive, lying in wait, torturing someone, that’s going to be first degree premeditated murder. You can also get to first-degree murder through the felony murder rule. Basically engaging in a dangerous felony where, if somebody dies as a consequence of that, you will be held responsible. So if somebody goes into a bank with a gun to hold up the bank and rob the bank, and someone ends up getting shot and killed, whether or not the bank robber intended for someone to get shot and killed is irrelevant. The fact that they engaged in a dangerous felony and somebody was killed is what would matter under the felony murder rule. Second-degree murder under the law is any murder that is not first-degree. Again, here, the difference between first and second-degree is premeditation. So, for second-degree murder an example would be two men arguing over a football game and things get out of control, things get really heated, somebody picks up the gun and just shoots the other person. Well, you shouldn’t kill somebody over a football game, so there would be no legal excuse. It would be murder, however the person didn’t think about killing them, they didn’t plan on killing the other person. They just did it. That would be the difference between first-degree and second-degree. It’s a very slight difference. So, say we take that second circumstance of two men watching the football game and one person picks up the gun and they point it at the other person, and a third person says ‘hey, don’t do that,’ the person with the gun looks at them, kind of acknowledges what they said, and turns around and shoots the person anyway, that would be a first-degree. Again, it’s the amount of time that the person thought about it, or reflected on it. It could be a very short time under the law; it could be a second. The jury would decide whether or not the person had time to reflect upon their actions of what it was going to do. There are 2 other crimes that can be charged as a result of the death of another human being, however these 2 crimes don’t have malice aforethought as opposed to murder. These crimes are voluntary manslaughter and involuntary manslaughter. Voluntary manslaughter penal code section is 192a. There is an intent to kill, however there is some kind of legal excuse. The classic example of voluntary manslaughter that they would teach in law school is: a spouse comes home and catches their husband or wife in bed with someone else. There’s a gun on the nightstand and in the face of this provocation the person picks up a gun and shoots both of the lovers. That’s the classic definition of a voluntary manslaughter. There’s intent to kill but it’s done in the heat of passion with reasonable provocation. Another form of voluntary manslaughter is conscious disregard for human life. A common example of conscious disregard for human life is something like playing Russian Roulette with someone, or towing somebody behind a truck with a tow rope on a skateboard at 40 miles per hour down the highway. These are acts which could be construed as conscious disregard for human life. Involuntary manslaughter penal code section is 192b, involves criminal negligence, but it really should be thought of as an aggravated accident. So an accident that nobody intended for somebody to get killed but they should have known better, there’s some kind of aggravating factor with it. For instance, taking somebody mountain climbing who’s never been mountain climbing for the first time and not using safety ropes. That would be an example of an involuntary manslaughter. The climber didn’t mean for their friend to get hurt doing it but they should have known better. There is another section of manslaughter called vehicular manslaughter, 192c, is when the killing is caused by the driving of a vehicle. There has to be unlawful conduct as well as criminal negligence. Vehicular manslaughter can be a felony or a misdemeanor. The next classification for felonies in California is burglaries. Burglaries can be first-degree or second-degree. First-degree burglary is stealing from somebody’s house. I have to use lawyer terms like “basically”, because there are no hard and fast rules in law, there’s a lot of grey area. So, you can also steal from somebody’s detached garage in California and that’s a first-degree burglary. However, in addition to stealing, you can also have the intent to commit a crime inside, or a felony inside, and that would be first-degree burglary as well. Second degree burglary is any type of burglary that isn’t first degree. So, any kind of stealing from a car, stealing from a business, stealing from a cargo truck, stealing from a train, that would be second degree burglary as well, commonly referred to as commercial burglary. The next classification of violent crime that I am going to talk to you about is robbery. And there’s first-degree and second-degree as well. The 2 degrees of robbery roughly parallel the 2 degrees of burglary. So, first-degree robbery, penal code section 212.5 is going to be stealing from somebody using violence or the threat of violence, scaring somebody within their home, within their vehicle, or around an ATM. Second degree robbery, penal code section 211 is every other kind of robbery. So robbing somebody in the middle of the sidewalk would be second-degree robbery, versus robbing somebody on the corner by the ATM machine where they just got money would be first-degree. Carjacking, penal code section 215, is using violence or the threat of violence and taking somebody’s car is carjacking. Using violence or the threat of violent and taking somebody’s wallet is robbery. So whenever robbery is used to steal somebody’s car, that’s called carjacking. Now I’m going to get into a category of crimes, which are assaultive crimes, or gun crimes. Generally speaking, I’m going to talk about penal code section 245 and 246. Penal code section 245 involves assault. There are different categories, there’s 245a and 245a has 4 different classifications. California Penal Code Section 245a1 is assaulting somebody with a deadly weapon; so a baseball bat, a knife. 245a2 assaulting somebody with a gun, 245a3 is assaulting somebody with an assault weapon. All these as opposed to a2, which is just a regular gun, a3 would involve an assault weapon. 245a4, it involves assaulting somebody with force likely to produce bodily injury. So, if a situation is a battering where somebody is injured very badly, then the DA will usually charge Penal Code 245a4, which is assaulting somebody with force likely to produce bodily injury. 254b is assaulting somebody with a semi-automatic weapon. Those are pretty much the most common assault crimes that are charged by DA’s. The list of assault of crimes under 245 gets pretty nuanced and extensive and if you want further information on that, you would have to speak with an attorney. The next classification involves shooting a weapon, for instance, penal code section 246 involved discharging a gun into an inhabited house, or into a car. 246.3 involves discharging a weapon with gross negligence. So, shooting a gun at midnight on New Years’ Eve into the air to celebrate would be an example of a 246.3. Another class of violent felonies in California is domestic violence. Usually the California penal code sections that we see DA’s charge for domestic violence, in a serious felony context, are PC 273.5 and then the PC 245. So, everything I just talked about with Penal Code 245 that can be applied in a domestic violence context. A woman against her boyfriend, a boyfriend against his girlfriend. 273.5 is domestic violence where a traumatic condition has been left. Thus, giving somebody a black eye; giving a boyfriend, girlfriend, husband, wife, you know, getting in a fight with them and giving them a black eye would be an example or a 273.5. The 12022.5 carries enhancements for the personal use of a firearm or 3, 4, or 10 years. The 12022.53 is typically regarded as the 10/20/life rule and going along with that, carries 10 years, 20 years of life in addition to the underlying felonies. I’m giving you the basics in a short time. To get more specifics you would have to speak with an attorney in person, and I would recommend that you do so. Touching now on the defenses for violence felonies. The first defense is that it wasn’t you who did it, it was someone else who did it. The second defense, plain, simple, and obvious, would be that it didn’t happen. I have seen examples where people have had injuries that were self-inflicted and they did that purposefully to get back and someone or to get someone else in trouble. Again, going with basic defenses to crimes, you’re going to have self-defense, defense of others, and an accident, as well as not guilty by reason of insanity. If you, or someone that you love, is charged with a serious felony, it is very, very, important, very good legal representation as soon as possible. And not just any attorney, you want to look for an attorney who has expertise in serious and violent felonies in California. You want to look for an attorney who has a lot of experience litigating the experiences, you want to look for an attorney who aggressively defends his or her clients. You want to look for an attorney hat has specialty in criminal law, who is well aware of the crimes that you are charged with, and who can give you excellent legal representation. I hope this brief outline has been helpful to you. I do not intend this outline to substitute for legal advice. Again, if you, or anyone that you know or love, has even the prospect of being charged with a serious or violent felony in California, you need to call a criminal defense attorney right away and look for the best credentials that you can get. I wish you the best of luck in whatever situation that you’re in and I hope this recording has been helpful to you.